I hate the term but I am going to use it anyway: I am a Kaweco fanboy. They make some of the best products on the market, and I have yet to be disappointed by any that I have used. Their designs are unique, with just the right mix of historical style and modern edge. In other words, right up my alley. When Kaweco offered me the chance to review a wide range of their products about a month ago I jumped at the opportunity. For the sake of disclosure, I received these products at no charge to review, although some of them will be returned when I am done. I will try to remember to include that in my Kaweco posts in the coming months but I wanted to put this out there in case I forget down the line. With that out of the way, I am going to cut to the chase and review the one pen I was more eager to get my hands on than any other: The Kaweco ART Sport. 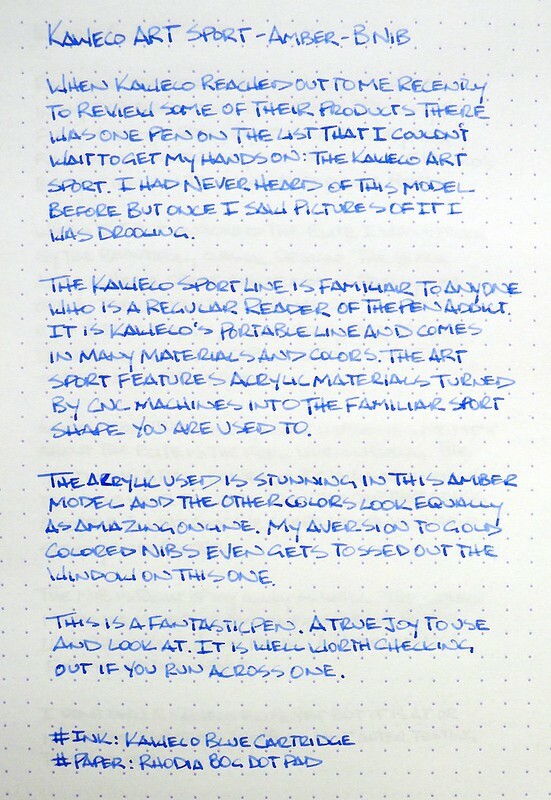 I have been a fan of the Kaweco AL Sport for years, and it remains one of my all-time favorite fountain pens to this day. The compact size, the quality construction, the smoothness of the nib. Kaweco nails it all. They did it again with the ART Sport. The primary difference with the ART versus the AL is the use of CNC turned acrylic to make the barrels instead of aluminum. If you think the Amber model looks good in pictures you should see it in person. The depth of the pattern is stunning, especially in the right light. And there are eight more equally as cool colors to choose from. One thing new in this pen that I hadn't tried before is Kaweco's bold nib. I have generally been averse to even trying anything wider than an EF nib, especially in a German pen. But as the old saying goes, try it, and you might like it. I did, and I do. Even more so, I love it and plan on keeping it. I can even look past the gold color! Have I fawned enough yet? Seriously, this is a great pen and a perfect addition to the Kaweco Sport lineup. The ART Sport model doesn't seem to have wide distribution at the moment, but can be found randomly through a search. I wonder if Kaweco has bigger things planned for this line going forward? 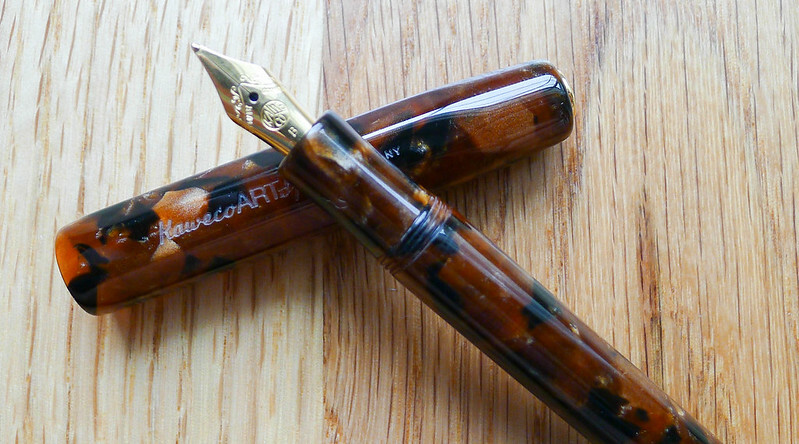 Be sure to check out Stephen Brown's video review of the Kaweco ART Sport. He is part of the #KawecoKrew also, as Ed Jelley has perfectly tagged those of us who received this wonderful care package from Kaweco. 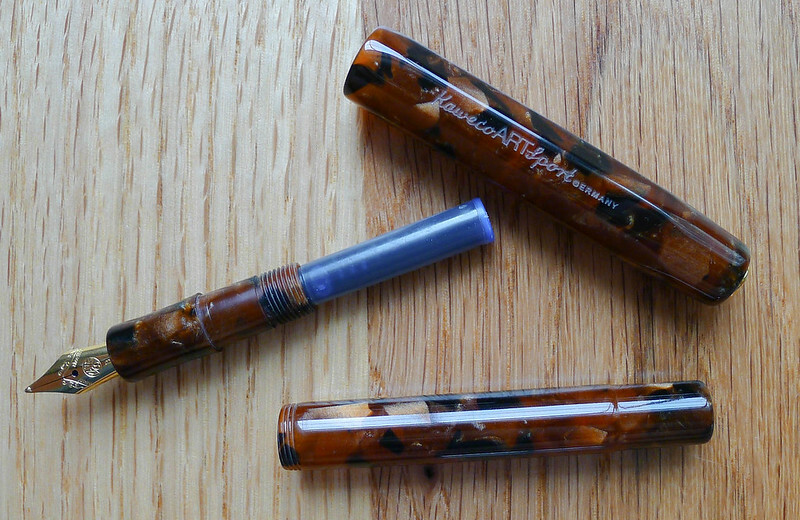 Posted on October 2, 2013 by Brad Dowdy and filed under Fountain Pens, Kaweco, Pen Reviews.